Welcome to Swatch Sunday! 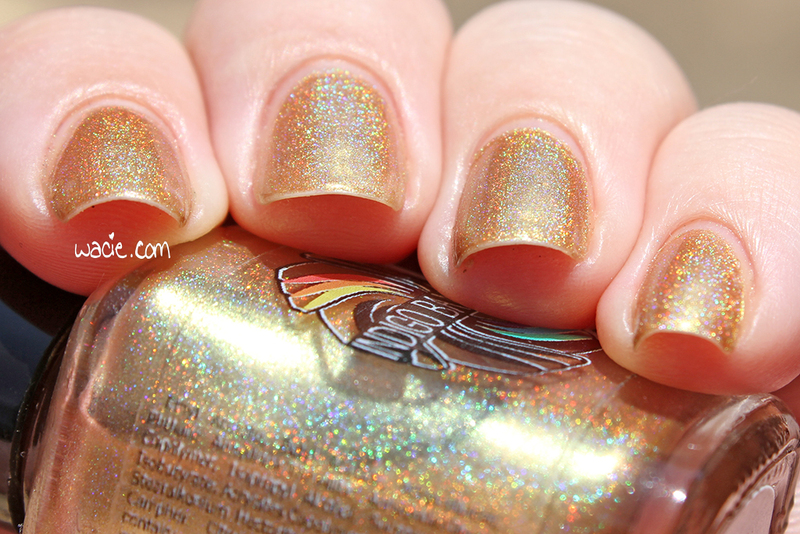 I get to swatch a holo today. I haven’t worn one since March; yes, I went back to check. 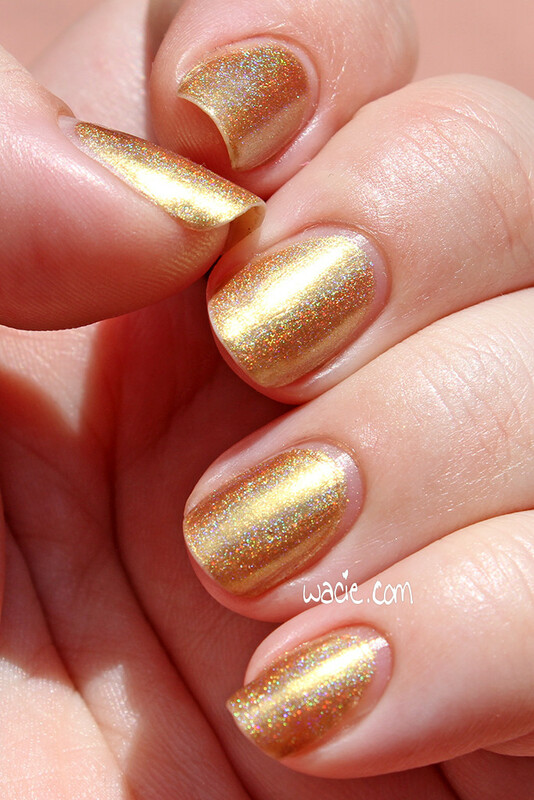 Now that we’re in the summer months, the sunshine is abundant except on the days I wear holo polish. 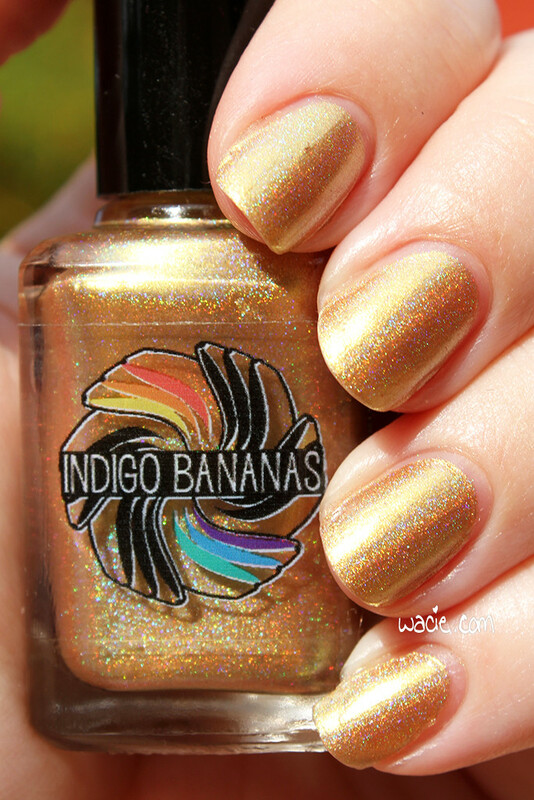 This is Indigo Bananas‘s Suneater, worn at three coats, with one coat of Rica‘s Glossy Glam top coat. All photos were taken outdoors in partly cloudy conditions. 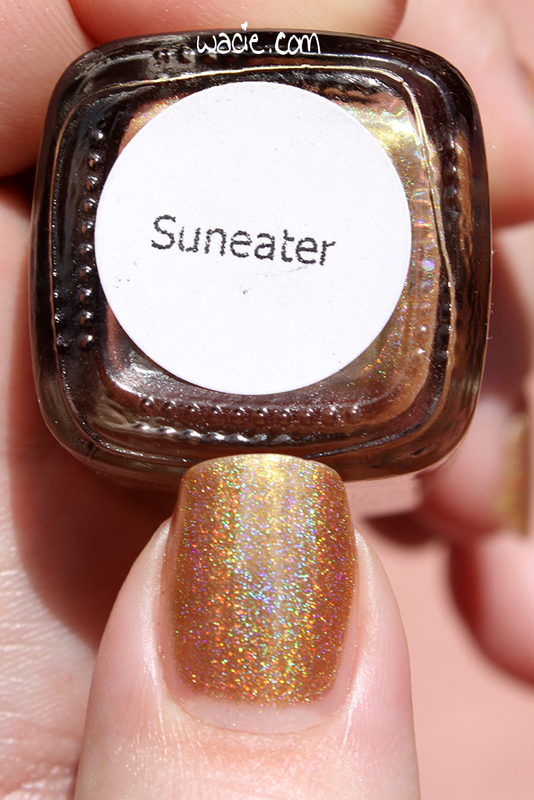 Suneater is a metallic gold/cool green duochrome linear holographic polish. There’s so much going on! Application was easy; the product consistency was on the thin side, which I sometimes find harder to work with. I made a mess with it a little, but it wasn’t too bad. The coverage is still a bit sheer, even after three coats; I still see a little bit of visible nail line. The holographic effect is strong outdoors, and less so indoors, though it’s visible in most lighting conditions. In dim lighting, or in the shade, the green duochrome effect is more obvious. The polish dries quickly and with a smooth texture; I added top coat to add shine and really bring out the holographic effect. 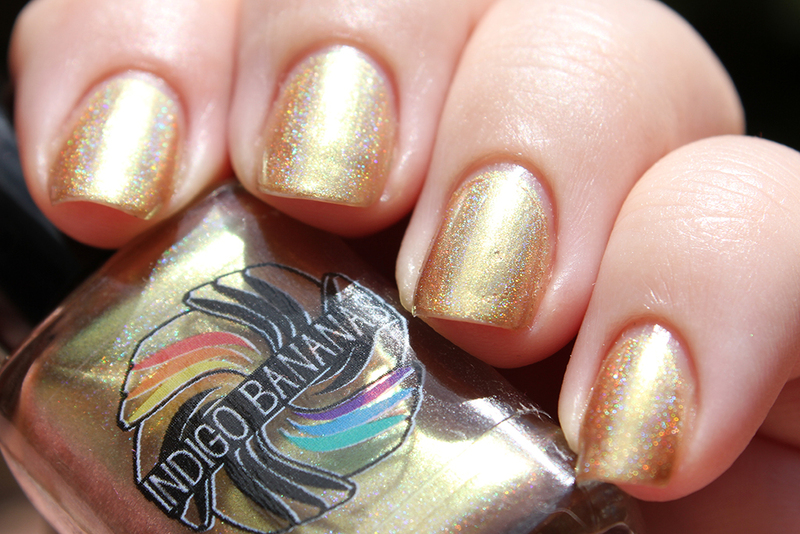 Indigo Bananas is still a pretty new brand to me, even though I’ve had a few of their polishes for a while. I bought four at once about a year ago and this is the first time I’ve used one for a full mani. If only I’d known what I was missing! 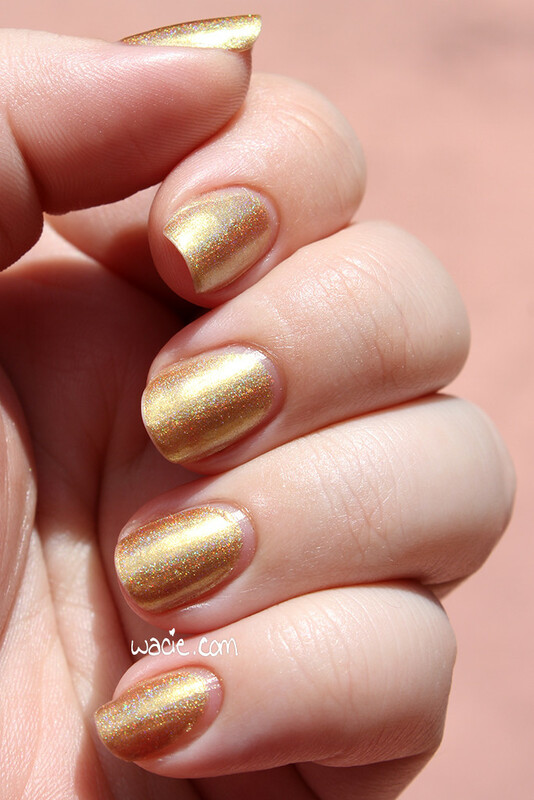 Suneater is a gorgeous polish; even just as a metallic gold, it’s pretty and interesting. The green shift and the linear holographic effect are just cake. 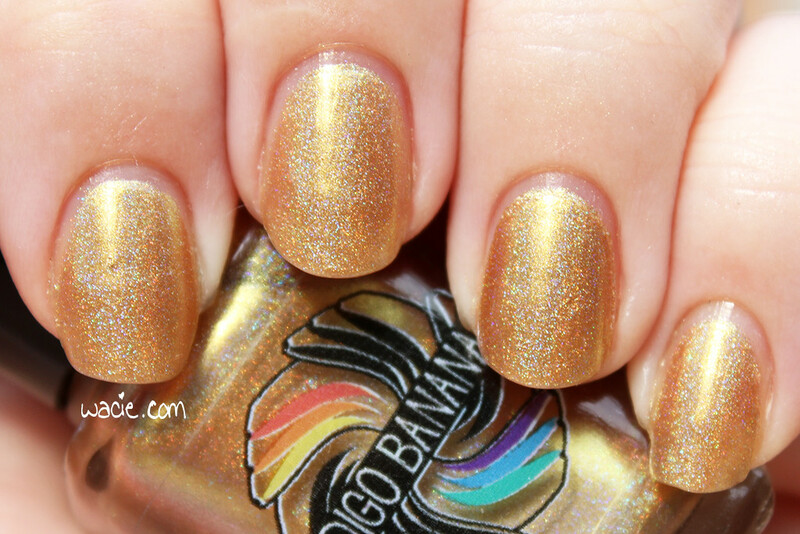 Suneater and other polishes are available from the Indigo Bananas website. 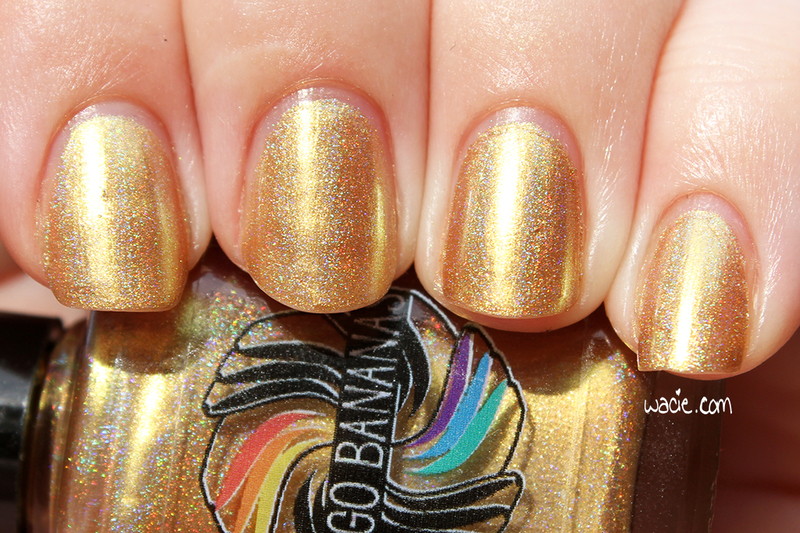 This entry was posted in Swatch Sunday and tagged duochrome, gold, green, holo, indie, Indigo Bananas, swatch.